ROME, Jun 16 2013 (IPS) - Humanity currently needs the resources of one and a half planets to support our lifestyles. But do we really need to burn out the earth in order to feed ourselves? A definitive “no” is the answer of the U.N. Food and Agriculture Organisation (FAO), which has partnered with the U.N. Environment Programme (UNEP) to reduce the pollution intensity of food systems, from production to consumption. Launched in 2010, the two agencies’ Sustainable Food Systems Programme has no easy mission: with the world population expected to reach nine billion in the next decades and three billion people predicted to join the global middle class by 2050, food production is likely to erode even more of the earth’s resources unless radical measures are taken. With this programme, the two U.N. bodies are embracing a new approach to food issues that calls for addressing all food-related activities in an interconnected manner. What does this mean? 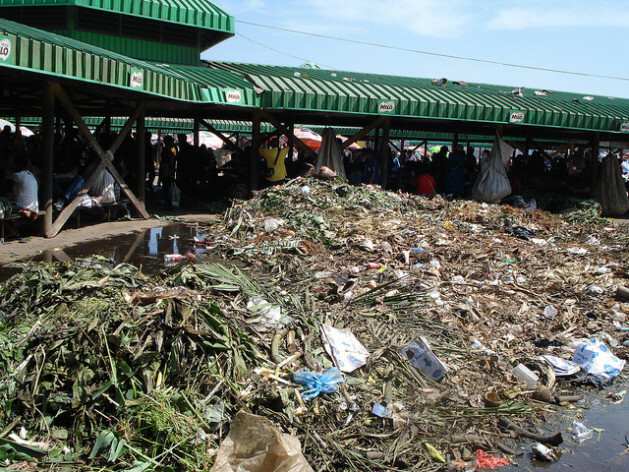 For example, when trying to assess levels of waste produced by a retail chain, one must take into account not only the food directly thrown away by stores but also the vegetables abandoned in fields in exporting countries because of the high esthetic standards imposed by the retailer. Addressing various parts of the global food chain separately only provides us with partial answers, according to this approach, while a more holistic outlook could bring surprising solutions. At least a third of the food produced today is wasted. The production of this wasted food takes up a quarter of water resources used for agriculture, and results in about as much CO2 emissions as the whole United States is responsible for in one year. This is a sign of system failure but also an opportunity: cutting waste means both increasing food available for the needy and reducing pollution. The systemic approach was endorsed last year at the Rio +20 Conference in Brazil, when all governments committed to a 10-year framework of sustainable production and consumption programmes. In coming years, the FAO-UNEP programme could translate, for instance, into assistance provided to authorities on how to make food production more sustainable; informing consumers about how to reduce waste; or “voluntary sustainability standards” (a kind of sustainability certificate) that producers around the world can adhere to. This U.N. vision of the future of the global food system must now be accepted and supported by governments around the world. The “voluntary” nature of the sustainability standards that are part of the programme already signals one of the potential weaknesses of this U.N. push, namely, that only some will commit to best practices. “Food systems may be something very obvious when you are in FAO or UNEP, but on the ground people are wondering how to manage trade-offs between the economy and the environment,” UNEP’s Fanny Demassieux tells TerraViva on the sidelines of the Jun. 15-22 FAO biannual conference. “But in reality, there is never a choice between agriculture and the environment because it is ecological foundations that agriculture is build on and depends on,” she adds. “The fact that 15 percent of us in the world are still hungry is a collective failure, and this is something we must face up to and this is why it is necessary to try new approaches,” says Demassieux.